While CBD is readily absorbed by the body and reacts with the endogenous human endocannabinoid receptor system (ECS), emollients, or skin-enriching compounds, are used for application purposes. Each of our CBD oil products uses only naturally-derived emollient bases from organic beeswax, cottonseed oil, shea butter, and jojoba seed oil, delivering pain relief while leaving skin soft and supple. More commonly known as essential oils, terpenes (C10H16 molecules) are fragrant, organic hydrocarbons that are found naturally in plants’ essential oils. These terpenes give off relaxing and invigorating scents, and are combined with menthol and/or camphor to deeply penetrate the skin and reach the most stubborn pain locked deep within the body. Every human is born with the endocannabinoid system (ECS), meaning our bodies possess powerful CBD receptors. Found in the mammalian brain, the ECS receptor system largely contributes to the proper functioning and regulation of neurotransmitters. Specifically, CBD oil has been meticulously researched, studied, and identified as an allosteric modulator capable of slowing down neurotransmitter signaling. 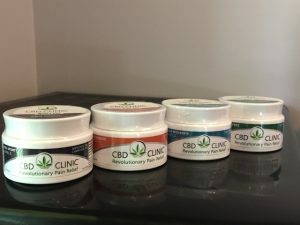 The discovery of the ECS’ ability to receive CBD has afforded researchers insight into the therapeutic relevance and pain-relieving benefits from CBD application. 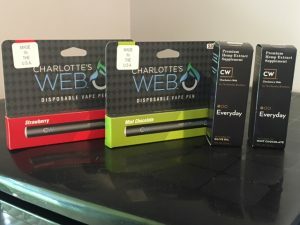 Although most CBD oils on the market are low in terpenes, we’re proud to offer CBD formulated with Charlotte’s Web cannabidiol, an entirely whole-plant extract derived from a patented cannabis plant that contains nearly zero percent THC, resulting in a completely psychoactive-free, pain-relieving experience. Combining CBD’s natural pain-relieving and relaxation properties with one of our many massage therapy services is sure to bring you not only temporary relief, but long-lasting comfort that radiates from within. Truly, coupling CBD oil with a relaxing massage is an experience that is not to be understated; the combination offers topical and internal respite from pain, stress, and other unsavory conditions. If you’re curious about how CBD oil and our massage therapy services can help you, please don’t hesitate to reach out to us to learn more or to schedule your appointment.